I hope that disappearing for a couple months on you guys isn’t becoming a habit, as this is the second time I’ve be AWOL. I apologize for that. I took a sort of unplanned break from writing and blogging over the summer because of laziness and spent most of my time either outside, or, erh, on Tumblr (and watching TV shows). But now with NaNoWriMo drawing so close I can almost taste it, I’ve been getting back into gear. As for what I’ve been watching the past months…well, if any of you are fans of the show you can probably guess from the title. That’s right. Star Trek. I started watching it sometime in late June, after my sister pointed out it was on Instant play. I had been admittedly dismissive of it because I associated it with Star Wars—I am sorry, I just didn’t like. Personal taste. But Star Trek. That is an entirely different story. I became literally obsessed, as did my mom (and my dad did a little too). Now if you’ve never heard of Star Trek, here’s the gist of it: More than two-hundred years in the future, the Captain of the U.S.S Enterprise encounters beautiful alien woman, brilliant people gone bad, warrior races wearing pink feathers, along with his…friend and First Officer, Vulcan/Human Spock and the Chief Medical Officer, and friend, Leonard McCoy who seriously don’t get along. And of course, to boldly go where no one has gone before. On a more serious note, it’s a sincerely uplifting show. Humanity, not humans, but ‘the quality of being humane; benevolence’ is one of the most important aspects of the show. So is the friendship of the three main characters, who undeniably are some of the most important people to each other. Diversity, too is a key element. An African American woman, a Japanese Man, and a Russian (this was filmed during the Cold War ) make up three members of the bridge crew. There is a shortage of woman on the ship, but the creator, Gene Roddenberry, wanted to have half woman, half men on the crew, however the network told him no, and he finally agreed after some arguing. One of the actors is also gay—George Takei, who plays Sulu– though he wasn’t out then. There may also be some other LGBTQ+ representation, but that all depends on who you ask. But I’ll get to that later. The show is also possessed with the gift to have layers. All good books have more than one layer. You can read Jane Austen’s books from multiple perspectives, and the first time you read Harry Potter, Artemis Fowl, Anne of Green Gables, take your pick, you read one thing, but then you see more and more things. Star Trek is like that. And it’s wonderful. I can watch an episode and enjoy the sci-fi, humanity aspect of it. Then, I watch it again, and I can see the romantic undertones between two of the characters, or the deep friendship between the characters. I can see it is a sci-fi based show, or a relationship based one, or both (which it is, really). And like I said, it’s uplifting. As much as I love Doctor Who, it can be…well, it’s Doctor Who, and he’s a lonely, mad man wandering the galaxy and never staying with someone for as long as he’d like to. 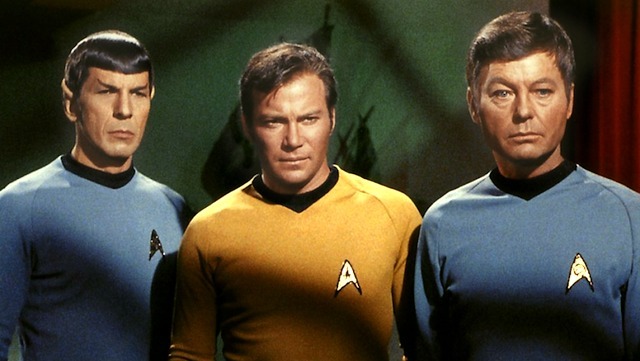 Star Trek…they’ve almost all said they are lonely at one point, but when it comes down to it? They aren’t. They have each other, and that’s a fact they couldn’t escape if they wanted to. And now the relationship aspect brings me to Kirk and Spock. Or rather, Kirk/Spock. It turned out the two characters were Kirk and Spock. And it spread. Oh, it spread. By 1987, thirty Kirk/Spock fanzines existed. And thus was born the term ‘slash’. Slash is basically love between two characters of the same gender. It is called slash because, with romantic stories between Kirk and Spock people would put a ‘/’ between their names, whereas they’d put a ‘&’ sign to indicate friendship. If you’re on Tumblr, you probably already know about slash and it’s background, so I’m not going to go on about it. This isn’t really going to be about slash. It’s going to be about Kirk and Spock. With slash, it is often looked down on is something teen girls write and art about. Which, maybe, is true. The majority of the residence of Tumblr, the fandom site I frequent, are around fourteen to twenty-two. But what’s wrong with teen girls anyway? Nothing. Though, sometimes slash does gets out hand, and isn’t about the chemistry anymore, but the simple fact that the two men look good together or something, which probably is more offensive than anything to the LGBTQ+ community. With Kirk and Spock though, there is something genuinely there. There is the reason it was the first published same-gendered pairing. It’s very unclear if it was intended or not, though I firmly believe there is a film editor, Fabien Tordjmann, who edited 22 episodes including some of the most romantic not exactly subtle episodes (I mean a 12 second stare off while smiling? ), that did it on purpose. I mean, when you watch those, he’d really have to have meant it. It’s terribly full of smiles, edited, most likely, to be aimed at each other, and long stares. The two characters are deeply attached to each other, whatever your interpretation of their relationship is. There is love there, certainly, whatever the nature of it is. They are most likely the closest to each other than they are with anyone else. Kirk has willing been prepared to die for Spock, and I’m sure Spock would do the same—and Kirk is one of the few people that understands him. That understands he is human, and he is (very) Vulcan. He is not one or the other, or one that should be the other. And intended or not, it’s a beautiful thing. Friendship or romantic, it’s a lovely, genuine, relationship. 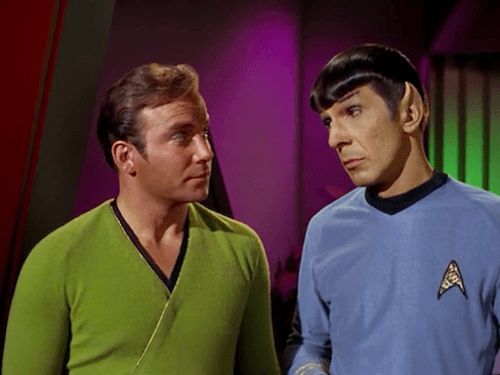 T’hy’la: A Vulcan word created by Gene Roddenberry for the relationship of the characters Kirk and Spock. On another note, I have almost 40 followers! Thanks so much guys! It means a lot! Once I reach 50 giveaway. I’m not sure what–maybe a graphic, or critiquing the first chapter of something. If you have any ideas, let me know in the comments!